In the Blue Bike Shed we are refurbishing old bikes that have been donated to us. We have bikes ready for adoption and are very busy repairing more as they come in, so we are now looking for good homes for our bikes. 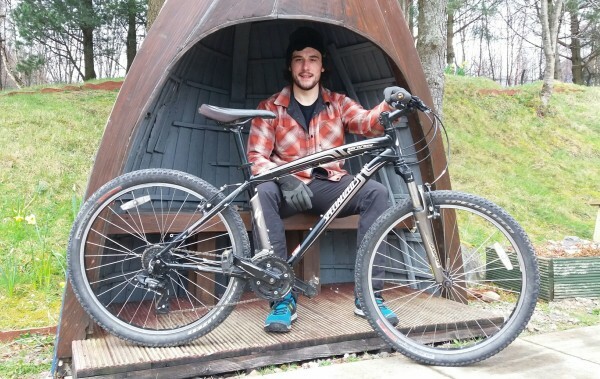 Our project started in April 2018 and is funded by the Scottish Government’s Climate Challenge Fund, so that we can bring old bikes back into use and provide opportunities for people to cycle more. If you are interested in adopting a bike you can Download an Application Form and return it to Kate at info@lochaberenviro.org.uk. All our bikes are in used condition, our community bike interns and volunteers have been trained to repair bikes so that they are in good running condition and safe to use. But please bear in mind that the bikes are not in new condition and have visible or hidden wear. Our bikes have been donated by local people who n o longer have a use for them, so we are looking for new homes and owners that will take the bikes back out on the road! This year we will be offering away up to 60 bikes, our bikes are only available on application. We want everyone to be able to afford a bike so if you are successfully matched with a bike you can donate what you feel. Any donations are used to buy more materials to repair more bikes and train our volunteers.